It’s common for people visiting New York City to explore the brightly-lit streets of Time Square for delicious food, but thankfully the area has as much authentic cuisine as it does quick tourist fare. Chef Dino Redzic and his business partners Paul Nicaj and Nick Krkuti have enjoyed great success with their famous Uncle Paul’s Pizza spot near Grand Central Station, but this winter, the men celebrated the grand opening of the trendy new Paul’s on Times Square, just a few blocks to the West. Born in Montenegro, Redzic’s father was a restaurateur from Switzerland. 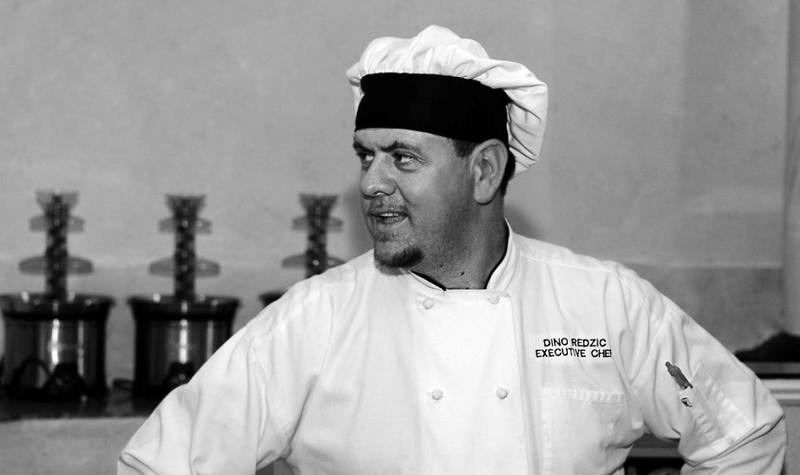 To say he followed in his father’s footsteps is an understatement, as Redzic eventually landed in the U.S. and worked his way from busboy to owner of several restaurants including Amici Amore, Butcher Bros. Steakhouse and Momento Italian Bistro in Queens, New York. 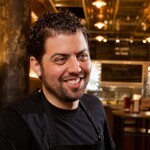 Dino started his career at the world-famous Rainbow Room, and even worked at the acclaimed James Beard House. Needless to say, he learned the ins and outs of the business from some of the most revered names in fine dining. 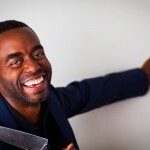 Through his journey, the ambitious Chef has learned as much about positive thinking and impeccable work ethic as he has about cooking up the perfect dish. You came here to America as a young adult and worked your way from the bottom, bussing tables all the way to having restaurants at Grand Central Station and now in Times Square. What have been some of your biggest challenges towards your growth? 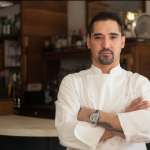 Dino Redzic: I think the biggest obstacles in earlier stages of my career was getting employed by some of the very best chefs in the universe to work for. Just to gain experience and say “Hey I worked for you”. Being with the James Beard foundation opened up many doors, and I was privy to working with some of the world’s most talented people. 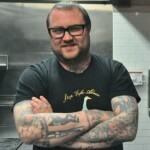 When you started out, did you target certain chefs or certain organizations that you wanted to work for? DR: Absolutely. I came into this country in the summer of ‘92. In the beginning of September, around Labor Day at my first job, I realized that anyone can own any restaurant. You don’t necessarily have to be Italian to own an Italian Restaurant. I worked with this guy who had a couple of partners who were Arabic and they both owned a very trendy restaurant at the time called Amici Miei on West Houston. None of them had ever been to Italy. I found that frustrating and I asked them, “How do you own an Italian restaurant and you’re not even Italian?” They explained it to me, they a had a very good Italian chef, an Italian maître d’, they loved the food, and if you invested money into it you could do it also. That’s when I first started dreaming about building an empire of my own. Who have been your personal biggest mentors in the game? DR: In the game right now my living mentor is my business partner Paul Nicaj, who is the most driven person I have ever met and happen to be an Uncle by trade. I’ve known him for the entire time I’ve been in the United States. But my mentor and the one who really showed me the way was Joseph Baum. To answer your first question, it was the most challenging to be employed by the Rainbow Room in 1994. Joseph would spend months, if not years, in France looking for chefs to bring to the U.S. and showed hospitality at another level. What are some qualities that you look for when mentoring young people, or how do you pick people that you’d like to mentor? DR: Living in the United States is a dream, clearly the best place in the Universe. You can be everything that you want to be, but you have to do it yourself. It is a privilege and not a right. I often do lectures and seminars on how important it is to encourage people to choose a profession that they are gonna like. I often use myself as an example. What everyone calls a good time is my every day. I am at work and I don’t feel like I’ve worked a minute – I often put in 17/18 hours and It’s very hard on my family. Right now I enjoy it, and I don’t consider it work. I consider it something that I have to do, and I often look for young people who are determined. They can’t say, “OK I really wanna be a rocket scientist and I need to pay my bills and I’m going to be a waiter” [laughs]. Which is ok, because I put myself through college. I was a ticket collector in Sarajevo just because I needed to survive, but I did that job with dignity and pride and I was very good at it, and knew I wouldn’t retire with it. But at that time I was focused on putting 100 percent of me in it. I bring them back to the same level today. One young man I sent to Johnson & Wales I promised a future under our umbrella if he graduates, because he’s got everything else but the diploma. He started at a very young age, and now he’s legal, but he just needs to get comfortable. If you are born in the country, you deserve to be college educated. I speak seven languages, and many of them not by choice. English is the last one that I learned and went to school for. In this country if you do not speak a language you cannot go forward, is what I am pushing. Speaking a language is one of the necessities that you have to go through. In fact, I have a lot of ladies and gentlemen from South America that are totally opposite. They may be golden at what they’re doing and having a bright future, but the language they aren’t learning quickly enough. I think that’s a major setback. What I look for in youth is determination. They have to first have an interview with themselves. What do you want to do for the rest of your life? If this is it, then I will certainly create a path for you ion how to get there. But if this just a passing though job, it’s still ok, as long as I can see that you’re giving 100 percent when you’re at it. This is not just a paycheck, it’s maybe an opportunity we can create for them. I have a simple slogan, “In our chef world we are a very different species”. I mean that in the most positive way. You give us a couple of challenges and we are the happiest campers ever. What are some ways you feel you’ve been able to adjust to appeal to a variety of people with your food? DR: The one and most important thing of all is being able to listen to what clientele wants. We all lived in our own way of “I’ve done this” and “This works at this location” may not necessarily work at another location. You have to be very observant, and you have to listen to the audience and what they want. Also, I travel a lot, and there are certain things we look for when we go to places that we don’t [already]know, and we also want to label ourselves with something that we do know and expect it. For instance, the restaurant in Times Square is a total New York experience. The whole restaurant is decorated in a New York style with pictures of important things that have happened here. We look at the fact that we are in Times Square and this is what it takes to do. Second thing is what do they love when in New York? Why can’t we share what Italian restaurants is in New York and there is plenty to pull from? Pizza, for instance. Why not showcase the best you and do to distinguish yourself from 99 cent Pizza or a chain offering to real deal New York? We do have the resources necessary. We have unbelievable water that it takes to do. Our climate is very positive. We have the know-how so why not show it? For the nights we can’t make it out to your restaurant, do you have any tips on how to create good pizza dough at home? DR: Why does it have to be pizza at home? [laughs]You can do so much. First of all, you have to have a nice oven that could sustain cooking it. Also you have too have a lot of time. You have to make the dough he night before. You have to give it at least 12 hours of resting in the fridge and before you make the pizza – you should leave it outside for about 30 minutes to adjust to the room temperature. It will allow you to spread it around quicker. Play with it. Do not try to make it perfectly round, that’s not part of it. What’s part of it is you expressing how you are gonna handle things. If you do it correctly and you mix your proportion of yeast, water, salt, sugar, and olive oil and crack an egg in it, mix it, let it rest, form it, fold it in, drop it, cover it in saran wrap and put it in the fridge. Next day when you’re ready, half an hour prior, unwrap it, put some flour on it and let it sit, 30 minutes later you’ll be able to form it into any shape you like. Do you recommend that people actually cook the crust first, brown it, and then put toppings on? DR: I highly recommend that at home, because your oven will not go to the temperature that you want. Preheat your oven to the maximum temperature there is. For pizza that’s what you need. First of all your crust has to be cooked, that’s why I recommend that you do it in two steps. Once to cook it and once more before you sauce it. The fact is you are not working a commercial kitchen where you can control the temperature. Each item doesn’t need much. For instance, if you were to use one of my pizza sauces, it needs no more than two minutes in the oven. In my oven, the crust needs seven, and the cheese needs a minute and a half, so you really have to be very clever to adjust the temperature of the stove in the air of the oven. Most kitchens may have a convection oven, which is all the circulating the air through it, or a conventional oven where you have a broiler on the top. None of those are necessary other than the fact that you need adequate temperature in that oven. If you cook the dough, I would stretch it in any position that you like. It doesn’t have to be round, rectangular or square. Once you stretch it to the shape that you like, just put it on a little screen and put it in that stove. I wouldn’t cook it all the way. Cook it 75% of the way. Let it brown at the bottom and let it show no dough in between. Do NOT cook the sauce for the pizza if you plan to bake it. Mind you, you want to cook the dough. You don’t want a doughy saggy thing in the middle of your pizza. Making a quality pizza, it’s one of the most challenging things to do at home. The thing is the oven. Its not really the dough so much or the ingredients you want to put in. It’s the temperature and the melting stage that you could be happy with. The bottom has to be crunchy, the top and the middle has to be cooked, and the topping has to be adequately warmed up. Like if you were to do ham or pepperoni or stuff that would require warming up to the point to where they won’t harm you if it’s not cooked enough. Then you certainly need to watch the ingredients that you put on. What would you say is your #1 goal in the next year in developing your businesses? DR: I want to offer a food venue to New Yorkers, to our every day citizens. Everyone is welcome, but I want New Yorkers to have the restaurant in this portion of the world who feel it’s a neighborhood. Yes, we have many tourists that go in and out, but I want New Yorkers to feel this is something they can claim as their own.